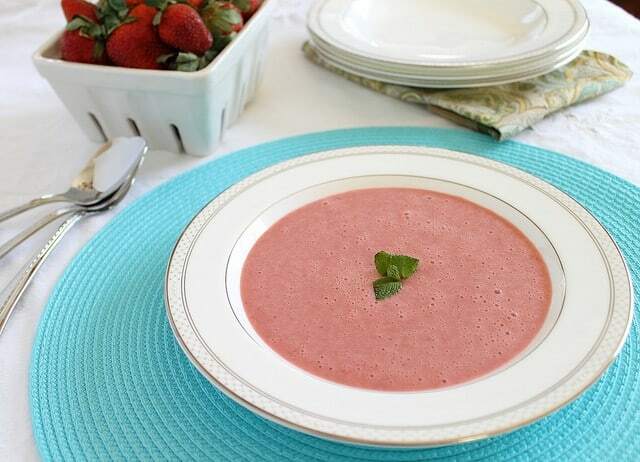 A chilled strawberry soup with orange and mint. Perfect as an appetizer or dessert on a hot day. The internet validates my crazy. Or, it’s just way easier to lie from behind a computer screen. Either way, strawberry soup is here because of it. I’m honestly not sure what to call this. In fact, I just stared at my categories for 10 minutes trying to decide which one it fits into. Is it a snack? An appetizer? A dessert? Just a smoothie poured in a bowl? Not sure…kind of all of the above. Regardless, it’s delicious. Especially, on 73 degree sunny spring days. Strawberries were 3/$3.00 or $1.50 each. Seriously, that’s what the sign said. I’d love to know who didn’t realize that and take the third pint. Nonetheless, there was a point this week in which we had 5 pints of strawberries in our fridge. Something had to be done. Although similar to a smoothie, I usually (as in never) take the time to simmer my strawberries with orange zest and mint before blending them up. That’s the part of this soup that makes it stand out. It’s like a slightly sweet gazpacho. I can’t imagine anything more refreshing as the start or finish to a summer (or March) meal. What up now Mr. Punxsutawney I saw my shadow Phil? 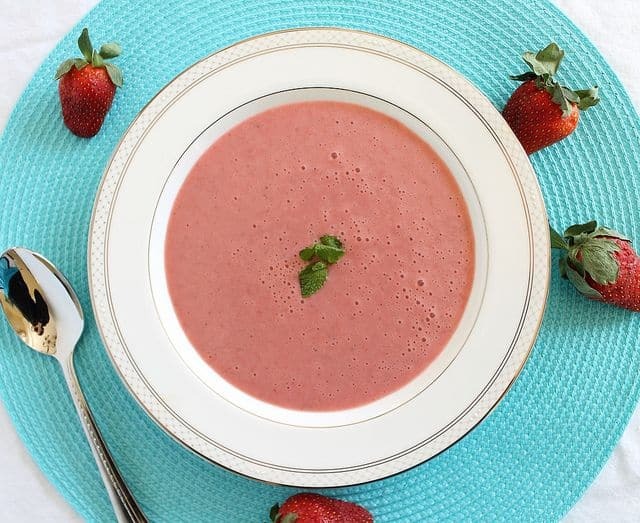 Combine strawberries through water in a small sauce pan and simmer over medium-high heat for about 10 minutes, breaking down strawberries with a spoon as they soften. Remove from heat and let cool to room temperature. Once cooled, combine strawberry mixture with kefir and milk in a blender and puree until smooth. Add more almond milk if you want the soup thinner. Chill soup for at least 30 minutes before serving. Pour into bowls and garnish with mint. Love the soup!! I am so jealous of your weather. Here in N. California, it’s rainy and in the 50’s. What the heck! It seems to be warmer everywhere else!! It feels like it’s always opposite weather. Freezing here, gorgeous in Cali and vice versa. Not crazy at all, I’d call this inspired! It looks so delicious and refreshing! I seriously cannot believe this weather! 70s…in March? Unheard of where I live! I love it though!! Yesterday I was outside in capris and a tank! I’m craving summery foods myself! BEen making lots of salads! It’s awesome :) Supposed to be 80 here next week! This looks so delicious and refreshing. Wish I saw this yesterday before i found my strawberries rotting in the fridge. This brings back memories of this awesome restaurant I used to go to in Philly when I was little. They had strawberry soup that was made with yogurt and fresh squeezed orange juice. Can I just say that I LOVE your China? Gorgeous. What a lovely springtime dish! thanks! My mother will happy someone said that because getting china & silver were her “musts” for me when we got married even though they sit in my china cabinet for approximately 363 days a year! mmmm sounds refreshing. I actually had the same “dilemma” yesterday with my chilled guacamole soup- smoothie? soup? what to call it. Love the strawberry and mint combo, remind me of my favorite mojito! 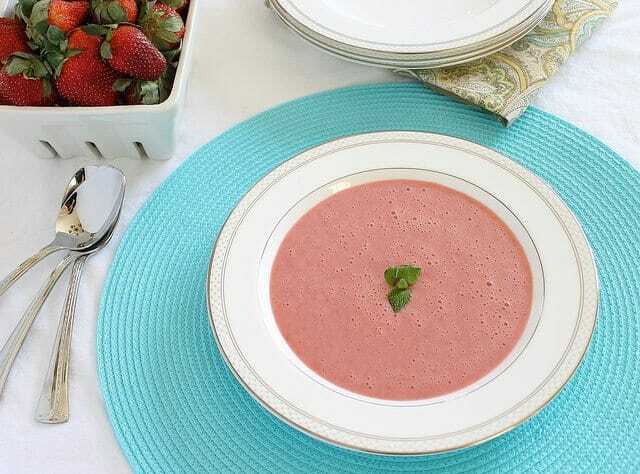 Strawberry gazpacho looks wonderful! I have everything on hand and will definitely be making these…. Argh! No mint though… Skip it? Or have to have it? I say skip it or if you’re feeling daring and have some…basil! Soooo excited for in-season strawberries! The top pic looks like it belongs in a Tiffany store! Same blue, same pretty gorgeous china, super classy….love it! strawberries are one of my favorite fruits. i can eat them in ANYTHING. i’m glad i was one of those 15 twitter replies that said go for it cause this looks AMAZING. so gorgeous and looks so delicious!! i love the pictures..so bright and cheery! I’m so glad you tried this. I looks so good. Can’t wait to try some! I’m not a strawberry person (it’s the seed texture) but my Mr would LOVE this! I’ll have to make it for him! That color!! So fabulous and so refreshing looking, Gina. This is my kind of summer recipe. I can see taking this in a thermos and sipping it at the beach all day long. Lovely soup! Yummy! I remember having a fancy chilled strawberry soup once and this reminds me of that. It looks so yummy, and I love the color too! I can’t decide if this is madness or brilliance. I want to add some vodka to it and call it a cocktail. That’s really beautiful. I can’t wait until it warms up a little and I can get in-season strawberries off the side of the road. Those are the best! I can’t believe you remember that! No matter what you call it, this looks delicious! This is going to be all over my summer! I love the internet because it introduces me to people with fantastic ideas…like this one and you!